If this unfortunate character, who for a brief period became a BITCOIN BILLIONAIRE, had been a clivemaund.com subscriber, he would have known to get the hell out of Dodge and would not have ended up broke and pawning his underwear. As you may recall we had some fun at the expense of those caught up in this mania around the time it peaked less than a year ago, starting with a BITCOIN TOTAL WIPEOUT ALERT on 13th December, and then calling the final top on the Monday after it occurred in The Bitcoin Market would like to thank The Greatest Fool for joining us to celebrate the launch of Bitcoin Futures on the CME, following up with a BITCOIN CRASH UPDATE on 24th and then gloating in the satirical SELL BITCOIN – BUY TULIP BULBS! posted in mid-January after the initial crash phase and finally rubbing it in with MUSIC FOR THE NEXT BITCOIN CONVENTION posted early in February. While all this may have seemed like cruelty towards those who got caught up in this scam, there was a serious purpose to it, which was to warn subscribers to steer well clear of it, and to expect it to fade into obscurity which is exactly what has happened. We haven’t looked at it since last February because we have better things to do with our time than waste it on something that is finished. 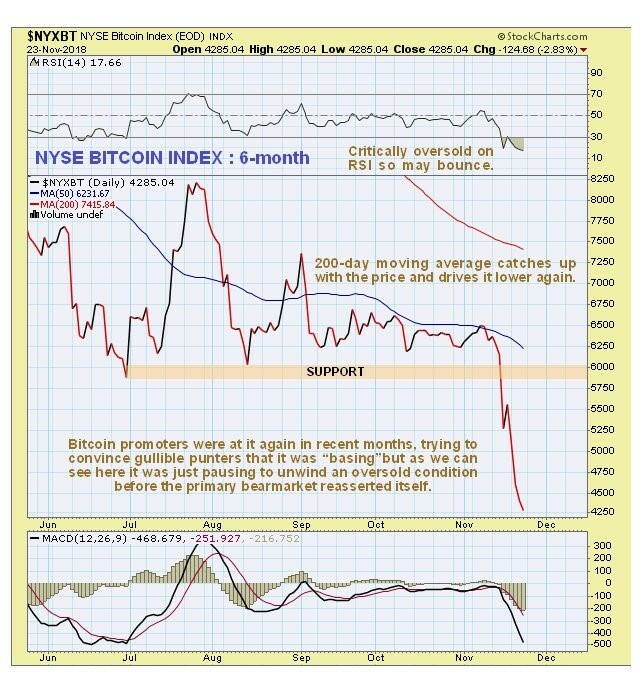 This article may therefore be regarded as a “post mortem” with the final “nail in the coffin” of Bitcoin being the sudden brutal plunge last week, which ended the illusion being put about by Bitcoin promoters in recent months that it was basing. 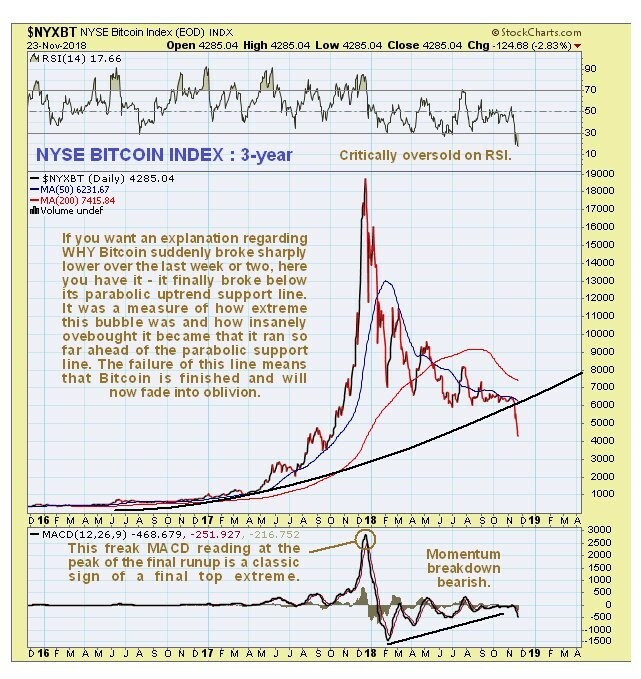 The following 3-year chart shows the predictable carnage that ensued in Bitcoin following the spectacular parabolic blowoff top, which was a classic. Bitcoin ended up with the dubious distinction of being the biggest mania of all time, even eclipsing the Dutch tulip bulb frenzy of the 17th century, the South Sea Bubble, the stock runup of the roaring twenties, the Florida land boom and the dot-com bubble. One of the most tragi-comic signs of this bubble being at its terminal stage was the pitiful sight of investors of modest means buying percentages of a Bitcoin at a vending machine, because they couldn’t afford a whole coin. On the 3-year chart we can see how the decline decelerated so that it looked like it might be basing in recent months, but last week’s drop put paid to that hope. 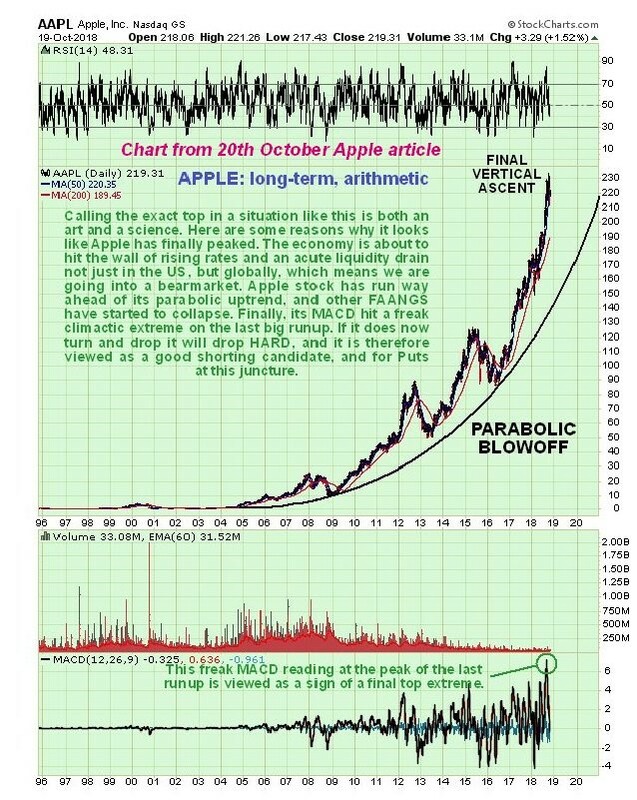 For the benefit of readers outside of the UK some explanation of the term “monster raving loony” used as part of the description of the extreme MACD indicator reading at Bitcoin’s peak is in order. The Official Monster Raving Loony Party existed in Britain in the 1980’s and it devoted its energies to lampooning the political establishment. Its leaders would campaign in outrageous outfits including top hats and gigantic rosettes, and it was the brainchild of His Excellency Screaming Lord Sutch . The 6-month chart shows more clearly that the drop of the past two weeks was substantial in percentage terms. Bitcoin should now continue to fade into oblivion and it is therefore of no interest to us – we prefer things of real value, like gold and silver.